I know, I know, it's not Sunday. I always do Project Tuesday on Sunday, but I tell you this project is very easy and cute for anybody who needs some quick special favors for showers, birthdays, or even a ladies luncheon. These would be so cute sitting beside each place setting for a thank you for coming treat. Supplies: 8" square double sided paper, Paper: K&Co., Stamp: Stampin Up-Yummy, Ink: CTMH-Hollyhock, ribbon-Offray, small heart brad. How cute!!! I agree....such an cute and easy project to use for party favors. Thanks for playing along with us at Project Tuesday!!! Great job on the pouch and the colors are perfect. Thanks for joining us over at Project Tuesday. Very cute & the colours are yummy! Thanks for joining us SSC this week. Love the pouch and the colors you've chosen...very nice! I'm so glad you were able to join us this week at the Stamptacular Sunday Challenge! Neat little pouch! It's great! 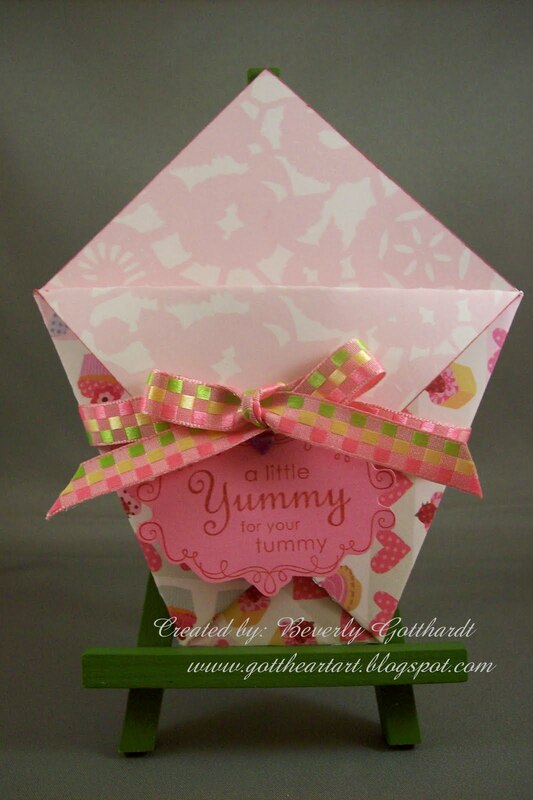 Thanks for joining in the girly challenge at Stamptacular!! Very cute and I love the designpapers. Thank you for joining us at SSC this week! A party favor - what a great idea ! I think I will try that for my next get together !! Lovely project. Thanks for the ideas. Thanks for joining in at SSC.